Are Your Workouts Destroying Your Dental Health? Being in the fitness industry, we are always trying to either maintain or improve our physique. One area that is focused on heavily is our dental health. 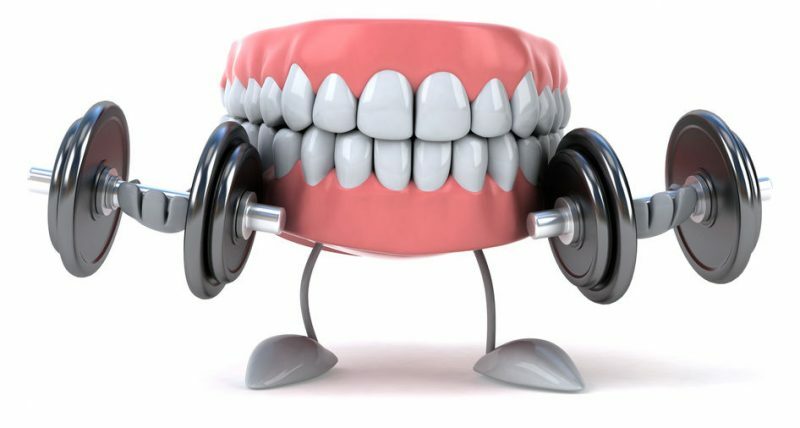 How many bodybuilders or fitness models do you see with stained teeth or dental health issues? Not many. Why is this important to you even if you aren’t actively in the industry? Because a smile is generally one of the first things we look at when engaging with another person. For that reason, it’s extremely important to maintain proper dental hygiene. But, did you know that your workouts could be destroying your dental health? It’s true, and the reasons why might surprise you. We all know the health benefits that come along with regular exercise. However, research has shown that with regular exercise comes some negative side effects in terms of dental health. While we can’t say these effects happen to everyone, they should be something you pay close attention to. Teeth Clenching – Some individuals have been found to clench or even grind their teeth when exerting max effort in the gym. This can cause havoc on your teeth, causing them to become worn down and in a worst-case scenario crack or break. If you find you fall into this category, consider a thin mouthguard similar to the ones worn for athletics. This will put a layer of protection between your upper and lower teeth and help improve the overall health. Dry Mouth – Regardless of the type of exercise you are doing, any time you are working strenuously in the gym you tend to breathe through your mouth. This aids in allowing for more oxygen to enter the lungs, but doing so can make your mouth drier than normal. When our mouths are dry, we cannot effectively remove bacteria from our mouth which can put you at a greater risk for tooth decay. In order to prevent this, it’s imperative that you drink more water while exercising as well as throughout the day. Staying hydrated in general has shown to be effective in improving many aspects of overall health as well. Sports Drinks – Many consider sports drinks to be essential to recover and rehydrate from intense workouts. While it’s true that many of these drinks include electrolytes, majority also include a massive amount of sugar as well and can cause as much as three times the amount of damage to your teeth when compared to a beverage such as soda. In addition, due to the acidity in sports drinks (primarily from the citric acid), they are more prone to breaking down and weakening tooth enamel. While I personally am not a fan of sports drinks in general, if you decide to consume them, make sure to brush your teeth shortly after to remove any leftover sugars or bacteria that may remain. Your best option, though, is to skip the sports drink all together and go with plain water. Skipping the gym to maintain proper dental health is not a good option – sorry to shoot down your excuse to get out of exercising. With that being said, there are some items you can carry with you on a daily basis to help give you the best chance of maintaining and improving your dental health. 1. Drink more water: It should go without saying (as I mentioned it above as well), but drinking water throughout the day will help keep your mouth clean and fresh by getting rid of bacteria in the mouth. 2. Chew sugar-free gum: Chewing gum is a great way to remove food particles that could have been stuck between your teeth. In addition, chewing gum can increase saliva production which can improve overall dental health. 3. Carry a toothbrush and floss: I wouldn’t say that this is the most ideal situation, but if you are able to toss a toothbrush and roll of dental floss in your purse or briefcase, you have the ability to get rid of anything stuck in your teeth after meals or to simply freshen up at any point during the day. Treat your dental health the same way you treat your heart health. The longer you work on improving both, the better off you will be. Next Next post: Do We Rely Too Heavily on Supplements?